Why should you choose a CIRCULAR SAW? Always use the correct saw for each application. Keep saws sharpened. A dull saw will not cut clean... and may break the saw. Support saw blade by using maximum diameter side collars. Side collars should be free of any dirt or foreign material when assembling. Always be certain arbor nut is tightened correctly. Larger arbor holes provide more rigidity and least amount of deflection. Use proper speeds and feeds for material being machined. Workpiece being cut must be rigidly held and positioned correctly. Resharpen saws regularly to obtain consistent chip removal and uniform cutting results. Never stop the saw and restart during the course of a cut. 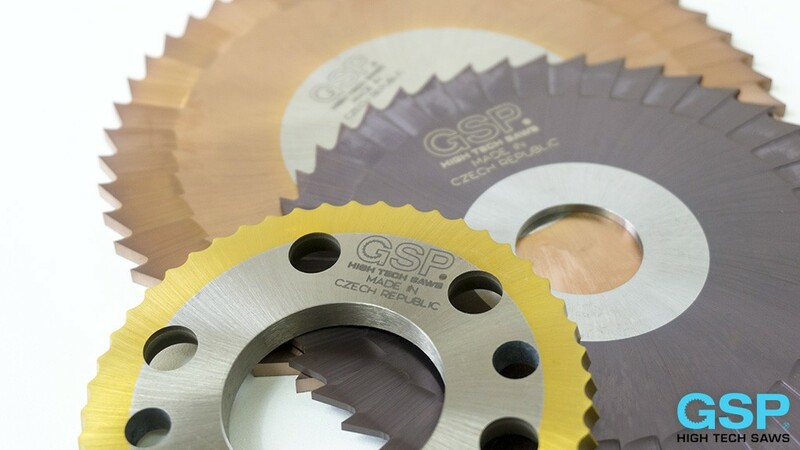 Circular saws GSP come standard with the following geometries, suitable for cutting steel and its alloys. unlike type A, is alternately bevelled, thus optimizing chip shredding. It is particularly suitable for precision cutting. variable pitch, is used to cut very irregular sections which cause severe vibration and noise. It guarantees softer contact and offers a good compromise between cut duration and reduced vibration. Once the material and the section to be cut have been identified, the pitch must be chosen. The correct pitch will prevent dangerous vibration and guarantee correct chip evacuation. The following data are approximate. Our engineers can advise on the most appropriate pitch for each specific application (stationary cut, flying cut, transfer) and the materials to be cut. 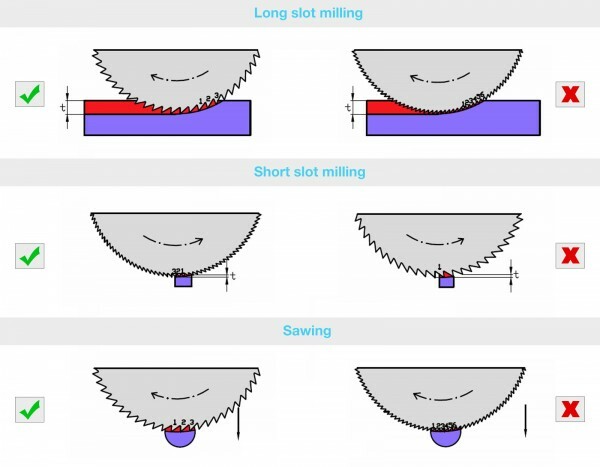 The cutting speed (Vt) is expressed in revolutions per minute and represents the speed of the tooth against the piece being cut; cutting speed does not directly influence cutting time. Cutting speed (rpm) is expressed in revolutions per minute and represents the disc rotating speed around its own axis; it can be determined by a rev counter, or obtained with the following formula. The feed rate (Av) is expressed in millimetres per minute and represents the feeding speed of the saw while it breaks into the piece being cut. This figure is directly proportional to the cutting time: the higher the feed rate, the lower the contact time. intermediate size bore use keyway for next larger size bore listed. saws not having keyway listed in table are special. high speed steels normally available are M-2, M-42, D- 2, T-15 and 440C stainless. In addition, other specialty steels may be quoted upon request. any diameter saw blade or circular product between the range of 1/2" to 10" within manufacturing capabilities. Metric sizes also available within these ranges. thicknesses as low as .003 in certain styles. 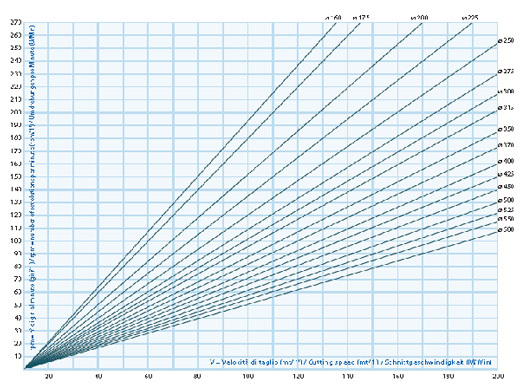 Dimensional tolerances as close as + or - .0001 depending on outside diameter and thickness. state-of-the-art grinding machines provide us with the capability of supplying blades between 50 and 2.2 TPI (teeth per inch) with a ground tooth form. Blades with pitches coarser than 2.2 TPI can be supplied with a milled tooth form. tooth styles are listed below for your convenience. Please check to confirm that we can manufacture desired tooth style with the type of circular product requested. * Blades will be furnished with a standard tooth design unless otherwise specified. GSP- High Tech Saws, s.r.o. supplies on a regular basis high speed steel blanks for manufacturers who opt to put in their own teeth. GSP- High Tech Saws, s.r.o. welcomes other saw manufacturers? requests for any products we manufacture.